France government came close to collapse in May 1968, enveloped in what was the largest political action in a developed country to date; eleven million workers protested over a period of two weeks in a political anomaly that rejected both communism and capitalism. 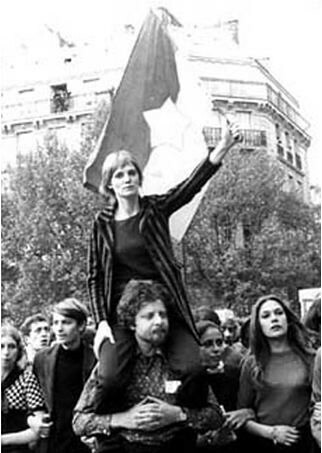 Student leaders of 1968 emulated the style and icons of the earlier revolutions in France — at times to the point of caricature. At the top of their subversive icons was Marianne — an allegory of Liberty and Reason since the founding of the First French Republic. Ironically, in May ’68, it would be an English socialite, Caroline de Bendern, who came to symbolize her. In an iconic photo from that May, de Bendern was perched on the shoulders of her friend the painter Jean-Jacques Lebel, the instigator of Odeon Theatre occupation. De Bendern was a rebel, having expelled from numerous English boarding schools, modelled in Paris and New York, consorted with the likes of Andy Warhol and Lou Reed, and made experimental films with the Zanzibar group. However, on May 13th, she was just an accidental celebrity — she rode upon Lebel’s shoulder because her feet were sore. She waved the flag of Vietnam, not because she herself protested Vietnam war, but because it was the flag Lebel had been brandishing. Yet, the ultimate showman, she posed as Marianne from her elevated position — a solemn mockery of Delacroix’s immortal La Liberté guidant le peuple. At Place Edmond Rostand, near the Jardin de Luxembourg, Jean-Pierre Rey took the above famous photo of her which was later published in Life Magazine on May 24th. Her patrician grandfather saw the photograph and disinherited her out of 7.5 million pounds largesse *. Caroline spent the rest of her life decennial and unsuccessfully suing Rey for the rights to the photo, in ’78, ’88, and ’98. Life was not better for Marianne herself. The tarnished icon was phased out from on the stamps, and during the 1789 Revolution’s Bicentennial, she was hardly seen. The photo, on the other hand, made numerous appearances: on the covers of Les enfants de l’aube (The Children of the Dawn) by Patrick Poivre d’Arvor and Paris-Match’s commemorative edition on 1968. *Her grandfather Maurice Arnold Deforest (1879-1968) was adopted by banker Baron Moritz Hirsch. No one knew where Deforest came from. It was alleged he was the illegitimate son of King Edward VII or an Austrian prince. The shadowy billionaire was later a Liechtenstein count (Graf von Bendern), a French lord (Châtelain of Beauregard), an English baron (Baron deForest) and a MP (for West Ham). thanks for the great posts, i’m a big fan of your blog. One minor thing about this post though, the emblem of France is “Marianne”, not “Marienne”. That’s a trully emblematic photo with an amazingly dissapointing story behind it. I enjoy the way you reveal the facts behind some impressive snapshots, to simply prove what they really are. Just snapshots, momentary peeps through the keyhole of history where everyhting may be so easilly distorted. I grew up staring at “Marianne” on a poster an uncle of mine had in his office. I was let down to hear her real story a few years back. Thinking about it now, I cannot but smile with how ironic life can be.